Belurana Collection - Victoria Manor, Upington Best Price Promise! Belurana Collection - Victoria Manor is situated in a quiet area near the heart of Upington, just of the main M10 highway. The guest house offers bed and breakfast accommodation in nine guest rooms, ideal for business travellers, honeymoon couples and families. Country Lodge, Upington Best Price Promise! Johnny and Nicolene welcome you to this beautiful thatched guest house in the heart of Upington. Country Lodge is newly renovated with five self-catering units offering peaceful and secure accommodation in a tranquil and secure location. Three Gables Guesthouse reflects a peaceful homely atmosphere where the sounds of birds singing in the palms and poplar trees will awake you. Our rooms are tastefully decorated and all are en suite each with a private entrance. We offer three single and three double or twin bedrooms. 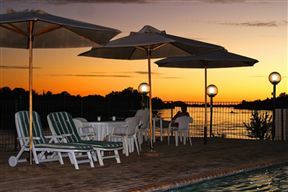 Avond Rust Guest House , Upington Best Price Promise! 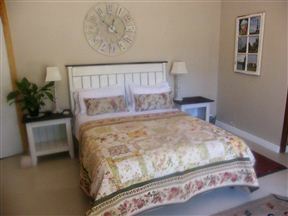 Avond Rust Guest House offers luxurious accommodation in Upington in the Northern Cape province of South Africa. Cross the historical man-made canal to enter peace of mind where the hadeda call. Sun River Kalahari Lodge , Upington Best Price Promise! Sun River Kalahari Lodge is home away from home, situated in the heart of the Green Kalahari and the staff look forward in welcoming you and extending their warm hospitality efficient service and caring staff to you. Das Dunen offers six Twin Rooms and four Double Rooms and is the best value for money. The rooms feature a separate bathroom, air-conditioning, free Wi-Fi and DStv. 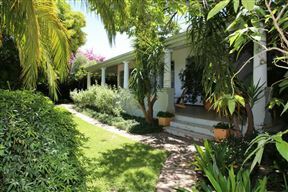 AG Bain&apos;s House , Upington Best Price Promise! Bain&apos;s House welcomes travelers to Upington and the Kalahari desert with luxury holiday accommodation overviewing the Orange River Valley. For a tranquil stop over in the Northern Cape, look no further. 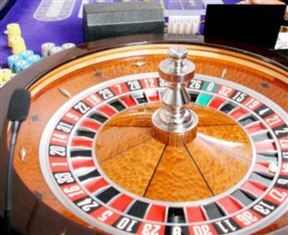 Situated in the heart of the rugged beauty of the Kalahari, Desert Palace Hotel & Casino Resort offers a memorable experience for guests visiting Upington. The comfortable accommodation and state-of-the-art conference facilities makes this an ideal choice for both leisure and corporate travellers. 4 Star accommodation. 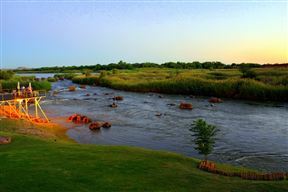 Conceived on the banks of the Orange River, in the central business area of Upington, whose timeless elegance and serene dominance provides a breathtaking vista, the Africa River Lodge imbues the magic of the Kalahari.